News now from Peter Hurzeler at Ocean Independence that the Mangusta 24.4m motor yacht Speedy T is back on the market for sale. Speedy T was Built by Overmarine in 1994 as hull number six in the Mangusta 80 series to a design by Stefano Righini. Refitted in 2011, she has twin 1,198kW MTU engines powering her to a maximum speed of 33 knots. Accommodation is for six guests in a master suite, VIP stateroom and twin cabin, all with en suite facilities and full sound systems. 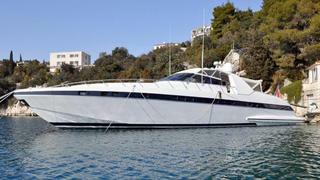 Lying in Trogir, Croatia, Speedy T is asking €600,000 with VAT paid.